Start off your visit on the 8th (Thu): take a stroll through Old Town, then appreciate the extensive heritage of Tomb of the Unknowns, and then stroll the grounds of Arlington National Cemetery. To see more things to do, photos, other places to visit, and more tourist information, refer to the Alexandria online trip planner . Washington DC to Alexandria is an approximately half hour car ride. You can also take a train; or take a subway. In November, plan for daily highs up to 59°F, and evening lows to 42°F. Finish up your sightseeing early on the 8th (Thu) so you can travel to Virginia Beach. Start off your visit on the 9th (Fri): enjoy the sand and surf at Virginia Beach and then take a leisurely stroll along Virginia Beach Boardwalk. 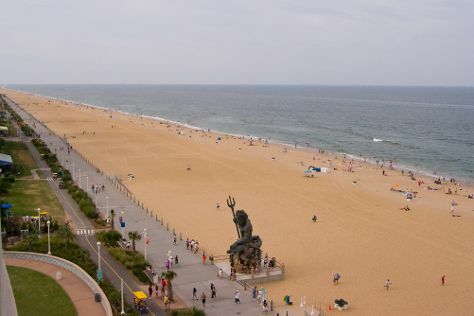 To find ratings, photos, and other tourist information, use the Virginia Beach trip itinerary maker website . Traveling by combination of subway, flight, and taxi from Alexandria to Virginia Beach takes 3 hours. Alternatively, you can drive; or do a combination of train, flight, and taxi. In November in Virginia Beach, expect temperatures between 62°F during the day and 43°F at night. Finish your sightseeing early on the 9th (Fri) to allow enough time to drive to Williamsburg. Start off your visit on the 10th (Sat): find something for the whole family at Busch Gardens Williamsburg. Get ready for a full day of sightseeing on the next day: steep yourself in history at Colonial Williamsburg, steep yourself in history at Historic Jamestowne, and then steep yourself in history at Jamestown Settlement. For photos, more things to do, traveler tips, and other tourist information, go to the Williamsburg attractions planning website . Drive from Virginia Beach to Williamsburg in 1.5 hours. Alternatively, you can take a bus; or take a bus. November in Williamsburg sees daily highs of 63°F and lows of 42°F at night. Finish your sightseeing early on the 11th (Sun) so you can drive back home.